I just discovered another reason to like Belgium, and it’s a modest looking place called Place Vendôme Haute Parfumerie. 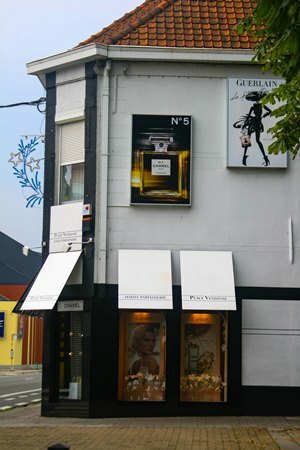 Modest applies only to the exterior of this perfumery located on a quiet street in the town of Wevelgem, one hour south-west of Brussels. 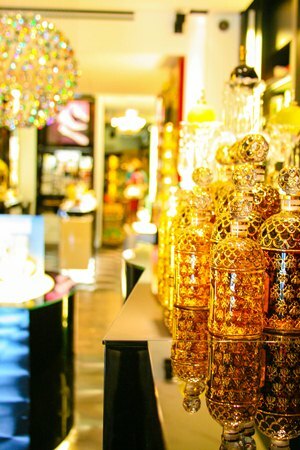 Inside, it’s an Ali Baba’s cave of the most exclusive niche lines and fragrance classics. The store is owned by David Depuydt, who along with his team has been in business for the past 21 years. I found out about Place Vendôme by chance via a friend who raved about the customer service and the jewelbox ambiance of the store. 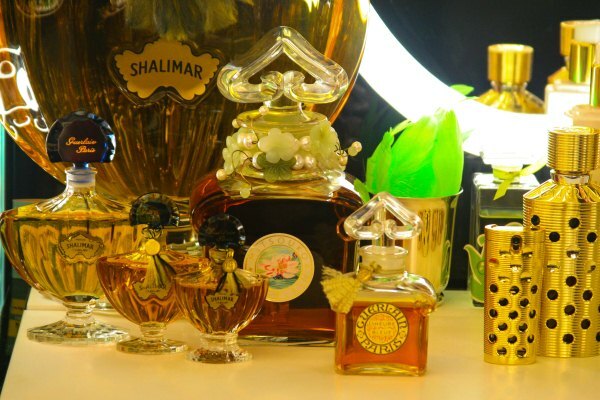 Similar praises were lavished upon the boutique by both the perfume historian Elisabeth de Feydeau and Guerlain’s creative director Sylvaine Delacourte. 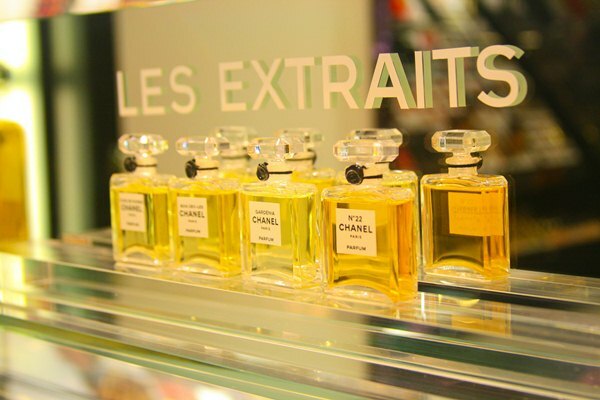 Although Brussels lags behind New York and Paris in terms of perfume shopping, fragrance isn’t hard to find in Belgium, where even the cosmetic shops like Ici Paris XL and Planet Parfum carry Serge Lutens and small lines like Kenzo, Rochas, and Tom Ford. A couple of weeks ago my husband proposed to visit the trappist abbey at Westvleteren that brews a particularly sought after beer. Since the abbey’s limited distribution of their beer rivals that of Serge Lutens bell jars, we decided to combine our interests in one trip. We’re a family of geeks, what can I say. 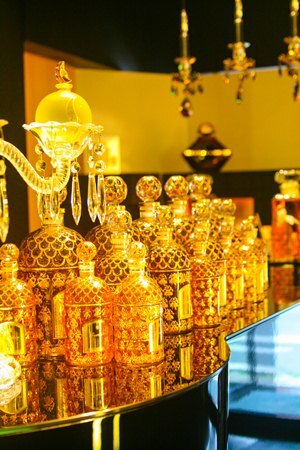 The first thing I said when we opened the door and stepped inside the boutique was “Wow!” The space is decorated with gold leaf and crystal chandeliers, evoking an Arabian Nights fantasy. But the boutique nevertheless retains an elegant look and an intimate ambiance. In addition to perfume, Place Vendôme sells some high-end skin care and makeup, a small, but well-edited selection. Besides the neat rows of perfume bottles, there are gorgeous ornamental flacons and factices (large size bottles made for display only). The boutique arrangement reminded me of a museum, where with every step you’re discovering something new. Guerlain, Annick Goutal, Chanel and Amouage are represented really well, with displays that combine fragrances and raw materials. The store also carries Cartier, Etat Libre d’Orange, Hermès, Serge Lutens, Parfums de Rosine and vintage gems like Balmain Ivoire. It’s the only place in Europe, besides Paris and London, where you can try the coveted Guerlain Les Déserts d’Orient trio. The entire range of Chanel fragrances is available for sampling in all concentrations, from Eau de Toilettes to Parfums. 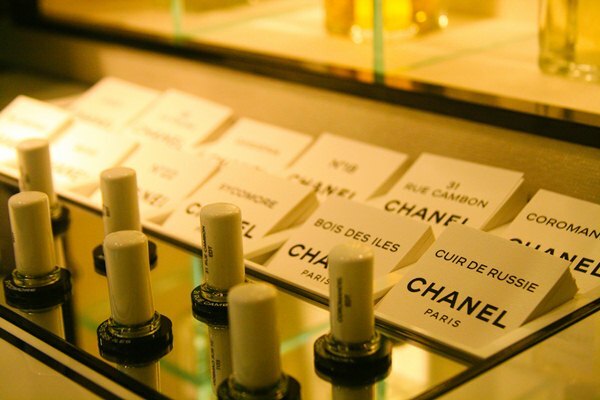 Should you wish to play with Chanel lipsticks and eye shadows, the display cases are nearby. Having gotten used to the polite, but indifferent Belgian customer service, I was pleasantly surprised by the generosity and warmth that I discovered at Place Vendôme. (For the record, I didn’t mention that I had a particular interest in perfume nor did I mention my blog until I was ready to pay for my purchases.) I, along with other customers at the store, was treated like royalty, and the hour or so that my husband and I spent at the boutique was more like an educational experience than a shopping trip. Steven Verstraete, one of the Place Vendôme specialists, showed me the fragrances I was interested in and gave great suggestions on wearing them. I learned about the launch of Guerlain Mon Précieux Nectar, the origins of the gorgeous Mitsouko bottle decorated with lotus blossoms (it’s a rare limited edition filled with actual perfume and it costs around 25 000 euros) and how Guerlain Delice de Peau cream can be worn with any Guerlain fragrance to add a more sumptuous aura. There was no pressure to buy or to make up my mind quickly. I could see myself spending an entire day at the boutique and making more discoveries, and I definitely plan to return. If you are a perfume lover, Place Vendôme merits a special pilgrimage. While Wevelgem itself doesn’t boast many great sights, it is close to Ieper, a city with an incredible history and moving World War I memorials. It is also one hour away from Brugge and Gent and 30 minutes away from Lille. 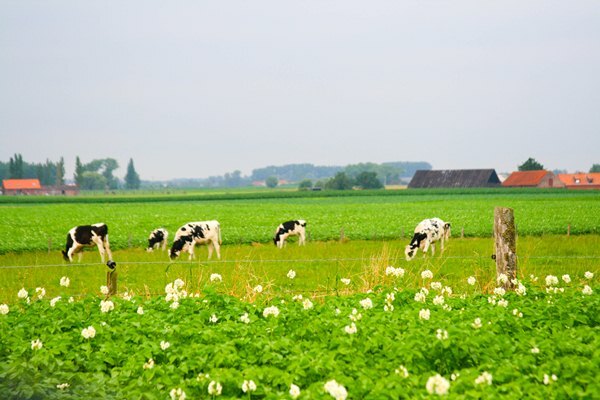 The surrounding countryside is dotted with tiny villages and scenic pastures. The Abbey of Saint Sixtus in Westvleteren is a must visit for beer lovers. Beer guides repeatedly declare its beer to be the best in the world, and since it’s not sold outside of the abbey (and even there, it’s available by appointment only) and the local cafe (thankfully, no reservations needed), it makes for a memorable discovery. Their Blond tastes bitter and hoppy, with a surprising creamy feel, while the Brune has a lingering aftertaste of chestnut honey and cinnamon stewed pears. 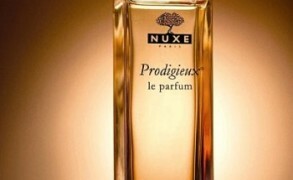 After testing your nose with the beautiful perfumes, it will be a great treat for the palate. LadyM: This place is incredible. I live in Lille and I visit at least once a month. Even in Paris there is nothing like it, professional, kind and generous. This summer I was too busy with my new baby to visit, but at least they ship and always include lots of samples. Victoria: Best of luck, LadyM! Two of my close friends had babies this summer, so I can just imagine how busy and happy you must be. LadyM: Merci! It’s my second, so I’m managing better. The first baby was a handful. My mom had to fly in from Kansas to help me (I’m American, married to a French guy). Victoria: Thank you very much for your nice words! It means so much to me. Lucas: So that’s the place you told we need to visit together when I get to visit you in Brussels. It looks amazing! Victoria: Agree with everything you said 100%! Our visit was a couple of weeks ago, but I already want to return. Henrique Brito: It’s always carefully wrapped and they are not greedy in sending samples, this is helpful to try harder to find perfumes and decide for one. Victoria: Thank you very much for dropping by, Marie! I’m also a big fan of Angela (and the whole NST team), so I’m flattered to be in such a nice company. It’s fun to share these discoveries here. Everything is so new to me, and I’m still finding my way around. Awfulknitter: I love Westvleteren beer. We have some ageing at home at the moment, from a visit we made a few years back. I’ve been saying we need to go back, and now I’ve got another reason! Victoria: We ended up buying some at the cafe (they happened to have some on sale), but the process to order it from the abbey rivals that of getting a residence card here! But it’s worth it. I was far from a beer lover until I came to Belgium, but the beer here is incredible. Westvleteren is great, but a more readily available Rochefort and Orval are my other favorites. At stores where they don’t give samples, I just label blotters and then ask for some tissue paper to wrap them individually. This way I don’t end up covered head to toe in perfume and can revisit scents when I get home. Figuier: Gorgeous pictures, Victoria, they are even more impressive than those on the boutique’s website! The array of gold-decorated bee bottles is particularly beautiful. Victoria: What made this place special for me was the knowledge and passion that the people who worked there communicated so well. It made me realize how much better perfume shopping would have been at the department stores if the counters were staffed by people who really knew their stuff. Victoria: Definitely more than achievable, Nicola! September should also be a good time to explore the countryside and drive around. When we were there, the whole fields were covered in frothy white blossoms. “What are they?” asked my husband. They turned out to be potato flowers! Victoria: Yes! And lots of cute cows! OperaFan: Dear V – Thank you for taking us along on your visits! It’s the next best thing to actually being there. Belgium is on my wishlist, but not sure I will ever make it over there. Wonderful photographs as well. Victoria: I love the fact that you have a very long day here in the summer. Right now is close to 9pm, but there is still lots of light. Makes it easier to explore even after we get home. Austenfan: And I visited Westvleteren last autumn and missed this. Thanks for the recommendation of what sounds like a great shop. Have you tried La Chouffe yet? In one of your earlier posts this week you mentioned a visit to Antwerp; did you enjoy that trip? It is not as obviously pretty as Gent and Brugge, it has some good places to visit though. The view from the MAS is wonderful and I personally adore the Plantijn Moretus Museum. It gives the history of bookprinting in a lovely setting. Victoria: I haven’t tried La Chouffe yet, so I just asked my husband to get some for tomorrow. Will let you know how we like. Westvleteren is great, and there is a complexity to this beer that is really fascinating. It’s really like a perfume, with top, middle and base notes. Austenfan: Isn’t the Westhoek amazing though? It’s so peaceful there now. I have visited there a lot, wanting to find out a bit more about WWI. (As the Netherlands were neutral we were not taught about that as much.) I am surprised every single time by how lovely and quiet it is around Yper, yet it must have been an inferno between ’14-’18. Nothing to do with perfume, but your lovely photo with the cows reminded me of my first visit in the area, a couple of years ago now. Victoria: Yper/Ieper is fascinating. The memories of ’14-18′ are so strong there, although from the looks of the place–so serene and peaceful, you would never guess. The locals don’t refer to WWI as such, but only fourteen-eighteen. At one point, I was very much interested in WWI and the trench warfare, and I read so much about it. It was a special experience just to visit the place. Illdone: Hello Austenfan and ofcourse Victoria! So happy those wonderfull people of Place Vendôme get into the spotlight. First time I went there I was a bit overwhelmed, like the feeling you get in a very fancy boutique. Since I’ve returned there many times (it is an addictive place!). I live about half an hour away from them in the Flemish Ardens, also a must visit, Victoria! But what I meant to say is ; if you’re afraid of getting lost, Austenfan, I would love to accompany you when you visit Belgium and Place Vendôme! Victoria, I read every post you write, your knowledge never ceases to amaze me and your eloquence is transporting. Victoria: Thank you very much for your kind words, Illdone! I’m taking notes too–we haven’t explored the Flemish Ardens that much, so we will in the coming months. Illdone: Oh, there are many more places to see and visit! Hope the home-sickness doesn’t persevere it’s not an nice feeling. For very grave cases there’s always our chocolate. Last but not least if I can help with anything, info, samples of perfume (I’m a collector and obsessed with perfume) do ask! carole macleod: It’s really kind of you to keep blogging, even as you move to a new country and have to learn a new language! Thank you! Victoria: I hope that she will get inspired to go! Brussels is a great city. Okay, now Belgium has skyrocketed to the top of my list of places to visit! I had actually just listened to the Roman Mars’ 99% Invisible show where they featured the abbey when I read your post! Victoria: Thank you, Catalin! You are lucky indeed. Florin G.: Visiting the amazing place you have created at Place Vendome changed my vision forever about perfumes and ‘products for the soul’ as I like calling them. You have created a ‘museum’ dedicated to this art and your knowledge, uniqueness, generosity and style makes this one of the most incredible experiences one can have! Isabeau: I love this place, it is really heaven on earth! Great service and I do agree with you on their passion and knowledge. This year my husband suprised me on my birthday with a night Antwerp and visiting Place Vendome, I had the best birthday ever! Victoria: Oops, my earlier comment to you disappeared somehow. Jessica: I felt so happy after reading this post! It was as though I’d just gone fragrance-shopping with you. What a beautiful store. Reading all this ensures me that there is still a lot of passion among people. And all your visitors can express there passions. David and his teams are nog fighters against they odds. 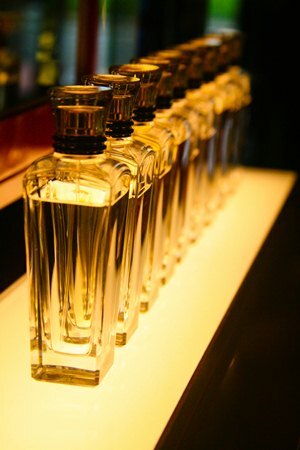 They express their passion for olfactory miracles as they are … worth living, enjoying …. with all the passion they have. Victoria: Natalie, thank you so much for the tip! It’s good to know that these perfumes are also sold in Germany.  Lori: I just discovered your website today…precisely because I have a visit planned to the Place Vendome in the next week and wanted to make a list of parfums to try. Imagine my surprise when I discovered not only an incredibly informed blog, but also an article on the Place Vendome! Victoria: Lori, I hope that you will enjoy your visit. It’s such a gem of a shop, and to find it in the middle of a farmland was like discovering a treasure.